A fun way to learn about science through music. How to teach sound waves. How does music work? Okay, that is a broad question. Music is a very personal experience. Let’s focus in on how we physically hear music. How does pushing a key on a piano translate to what we hear as a musical note? The science of sound comes down to one main thing: sound waves. Simple waves can produce that beauty that is a symphony. But let’s not try for that right now. Let’s keep it simple. Grab some glasses of water and let’s explore the science of music. Waves are characterized by two main properties, frequency and amplitude. Amplitude is the size of the wave and this impacts volume. (This is why we have amplifiers.) The larger the wave the louder the sound. The frequency is the speed of the wave and this impacts the pitch. The faster a vibration the higher the pitch we hear. There is an easy way to think about this. Picture two cymbals, one really huge and one really small. If you hit the small one it will vibrate very quickly, creating a high pitch sound. It is also smaller and has smaller vibrations, meaning the sound will be quieter. The large cymbal will have slower vibrations and create a deeper sound. It also has larger waves since it is so much bigger, and is naturally louder than the small cymbal. One challenge of sound waves is that we can’t readily see them. Fortunately they work in a similar manner as water waves. So we are going to get some water and use to explore sound waves. This is a very basic activity, but you can take it to higher levels based off of your child’s interest and ability. Fill a few glasses of water with varying levels of water, then let your child tap on the glasses with the spoon. Listen to the sounds. If you watch carefully you can see the water vibrating gently. This is the wave that mimics the one that produces the sound. How are these sounds being made? When you tap the glass it creates a vibration. The water provides a medium, besides the glass itself, to relay the sound. It also slows down the wave. More water means a slower wave. 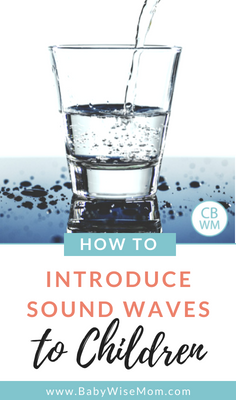 Slower waves mean deeper sounds, so the glass with the most water will create the deepest sound. Younger children, if they are anything like mine, are pretty pumped to just get to hit glasses with spoons. So having just a few glasses making distinct sounds is plenty. We used one glass that was almost completely full, one that was halfway full, and one that was almost empty. First we tapped each glass one at a time and talked about the sounds. I found this was a good time to introduce the idea of high pitches and low pitches. Don’t worry, this isn’t hard and you don’t have to be super musically inclined to talk about these ideas. I had Ben make a squeaky voice and talk as high as he could, and this is a high pitch. Then we talked in low voices and tried to sound like Daddy. These were the low pitches. Let your kids tap out rhythms and try making a little song! This is a super simple activity, but you can challenge your older children. 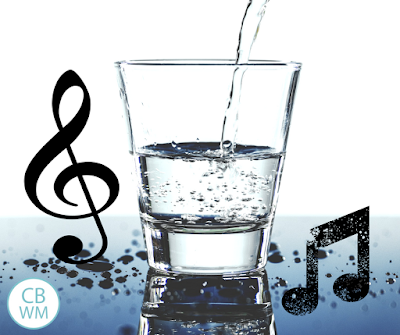 Add in more glasses with different levels of water to create more sounds. How many distinct sounds can you hear? Does the shape of a glass impact the sound? Try short and tall glasses. Do wine glasses create different pitches as opposed to drinking glasses? If you have a piano, or other tuned instrument available, challenge your child to match a note. Can they get the level in the water to match a note on the piano? This takes a careful ear and a lot of patience. Can your child match more than one note? Finally, can they recreate a simple song? This can get as complicated as your child wants. 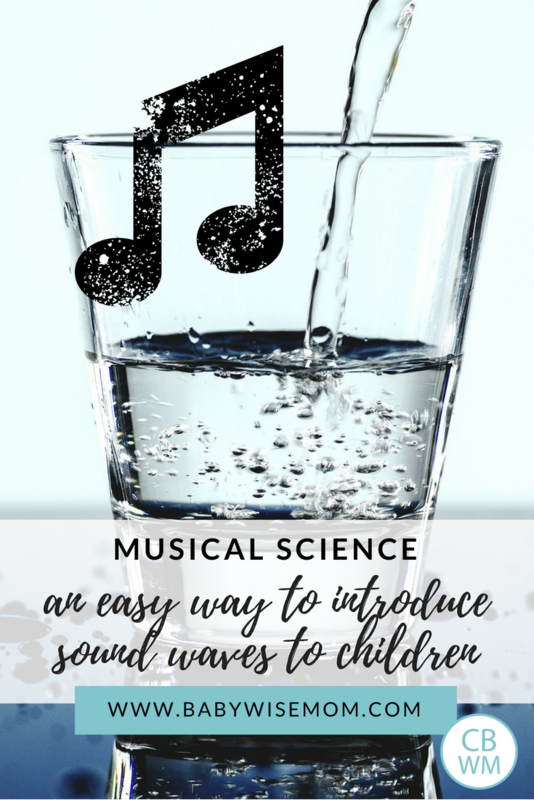 This activity is perfect for a simple introduction to sound waves and some basics of music. It is also one that older children with a real interest in music and the math behind it can use to explore deeper. What will your child discover? There is so much going on in even the simplest of notes. Here are some additional resources if your child is interested in learning more. Why do some chords sound good, but others do not? How do scales and chords actually work? 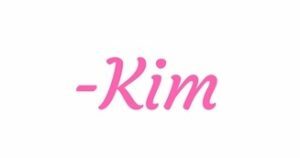 Kim is the mom of a 4-year-old son and 2-year-old twin daughters. She is a STEM advocate and blogs at Team-Cartwright.com. Follow her on Facebook, Pinterest, and Instagram!